The Avalon Arbor pellet stove is an ornate cast iron stove with intricate cherry blossom decoration cast into its sides and curved cast iron legs. 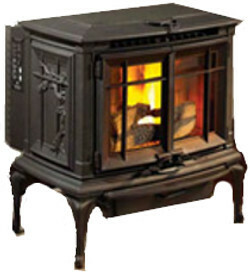 Rated to heat an area of 2,250 square feet, this elegant 'olde worlde' style stove will produce 45,100 btu. Avalon use the cast iron front and sides of this stove, as well as the twelve tube heat exchanger and a quiet 165 cfm. blower to efficiently transfer heat to the home. The hopper size of fifty pounds allows a burn time of twenty nine hours between refills. Extremely efficient, at 85%, the Arbor has an emission rate of 0.9 grams per hour. The large ash pan slides out on ballbearings and has a built in handle for easy carrying. The Avalon Arbor has a 'maintenance required' diagnostic system on the control board. Clean the heat exchanger tubes, vacuum the hopper, remove fly ash from the upper baffles. Remove the firebox back, clean the back of the stove and the vertical and horizontal exhaust ducts. If you would like to leave a review of the Avalon Arbor pellet stove or fireplace insert, please use the form on the contact page.